Luxe DVD Cases – Wrap up DVDs from all of your fall family sessions in our new, affordable Luxe DVD Case. Printed on Classic Felt press paper, the Luxe DVD Case holds one CD/DVD and features a simple white snap for closure. Order one branded design for all sessions, or upload a custom design for each client. Cases are sold in sets of two. Two designs can be uploaded in one order. Flat Luxe Cards & Folded Luxe Cards – With the wide array of holiday cards available, it’s more important than ever to offer unique card options to clients. Printed on our luxurious press papers and die-cut into distinctive shapes, our Flat Luxe and Folded Cards fit the bill for even the most discerning of clients. Want to help start a new family tradition? Get the Circle Luxe Card with a pre-punched hole to create a custom ornament that is sure to be hung on the tree year after year. Luxe Frames – Up the gift-giving ante with a one-of-a-kind frame. 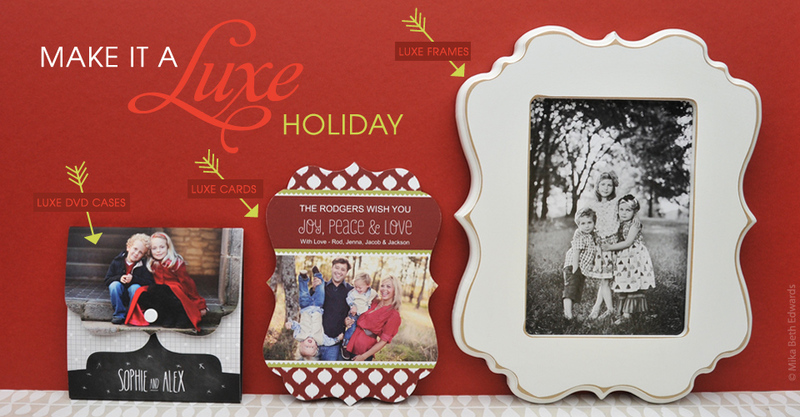 Luxe Frames come in 5×7, 8×10, or 10×10 sizes and a variety of playful shapes. With super quick holiday turnaround on not just Luxe products, but all Miller’s products, you can easily make it the hap-happiest season of all for both you and your clients.